Along with sketching while Marcy and I were visiting in LA, she had fun taking photos with her iPhone. 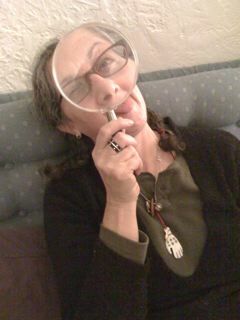 In the pics above we were playing with my mother’s big magnifying glass. I think these images quite satisfactorily represent our experience. Now that I’m on vacation, not visiting family or taking care of a high maintenance dog, I’ll have time to draw and paint and post art again. Thanks for reminding me to let go of wanting logic and order when dealing with my out of order mother. 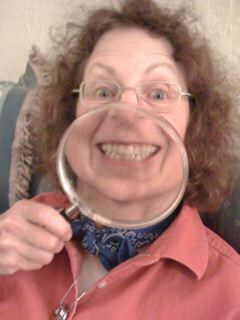 I need a pair of crazy eye glasses. Very funny! I love the edge of hysteria. A portrait of Marcy’s face top and your face bottom put together could possibly come next. You and Marcy are such great sisterfriends. Edge of hysteria is exactly where we were, though maybe not the good kind of hysteria! Jana it worked! I visited my mom, didn’t expect candy bars and it was good. If I keep that out of order vending machine in my head I won’t drive myself, or her. crazy. I don’t have expectations and she won’t disappoint me.